Discussion in 'Shelby GT350 Mustang' started by Tomster, Nov 26, 2017. Some of you may recall that I am trying to ready HR 361 for the track weekend coming up. I went to my friends shop this AM to find the lift is still being used. Some of you may remember that my friend has quite an elaborate shop and he works on high end Porsches and such. Today I arrived to find a Lamborghini on the lift and it wasn't going anywhere anytime soon, so the MGW shifter is out for now. However..... Way up on my list of things to accomplish is camber plate and caliperfexion caliper stud installation. So I turned around and went home to start the work. The vorshlag plates will be written up when the job is complete, so in the mean time, I will highlight the caliperfexion stud installation. First, the front wheel lug nuts were loosened before jacking the car and putting it on jack stands. Once up in the air, the front wheels were removed. A torx T60 bit is needed to remove the brake caliper bolts. I strongly suggest using a breaker bar because these bolts are very tight, to the order of around 130 ft lbs. Once the caliper bolts are removed, the caliper will pull right off. I suggest having some wire or zip ties to suspend the calipers from a secure point because you don't want them hanging by the brake line. Find the best caliper bolt in the lot (in terms of thread condition as well as overall condition) and clean it up with a wire brush. Use this bolt to chase the threads (screw it in and out) of the knuckle until you can turn it by hand with no assistance of tools. Be sure to blow out the contaminants between attempts. Eventually, the threads will clean up and you will be able to screw it in by hand. Eventually, the threads will look like this. You should be able to install the new caliperfexion stud finger tight (snug). Install it and check overall length. (see instructions for length value and tolerances). Once you have verified that the threads are clear and the stud will bottom out leaving you with the appropriate overall length, it is time to mount them using some blue Loctite and a torque wrench. Note: The instructions specified not to reef the stud into the knuckle and to use 5 ft lbs of torque. I thought that was really low and verified that with Epiphany via text before completing this step. That sounds awfully low, but he's a smart guy..... BTW, a specification of 5 ft lbs equates to a value of 60 in lbs (you might want to use a torque wrench with values in the in lbs). 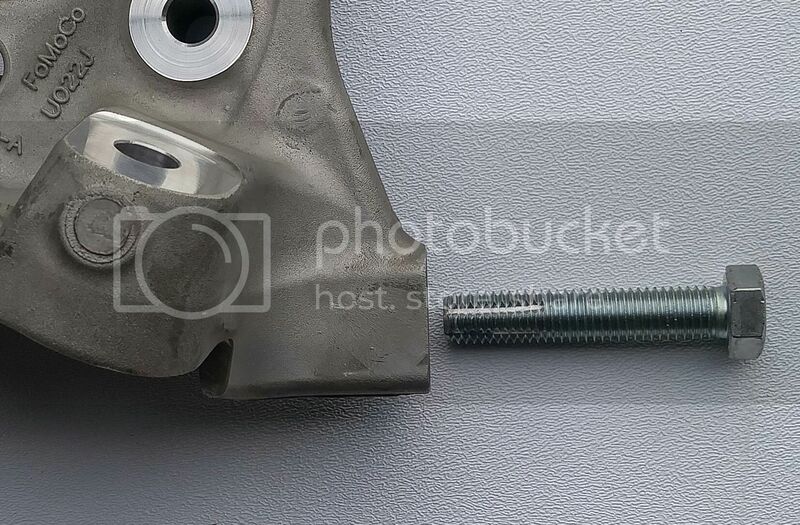 Borrowing the below image from above, notice the double nuts on the stud. Snug them up against each other so that you can torque the stud to length. Now, it is important to let the Loctite cure as per the manufacturers directions. Since I am doing the vorshlag plates at the same time, I will pick it up and finish the installation tomorrow. For all practical purposes, the caliperfexion stud installation is complete. All that is left to do is re-install the caliper and torque the nut as per the instructions. I would like to thank Epiphany for providing such quality parts. These caliperfexion studs will make future brake pad changes a snap. I know this because I had them on my previous track pack. After a weekend of heavy braking, I had to swap the pads out. It was as easy as could be. Bullitt40, mephim, Minn19 and 12 others like this. Thanks for the write up, I'm doing this over the winter break. A tip for the crowd . . . .I find if you grind a single groove thru the threads down the length of one of the original bolts (kind of a makeshift tap), the thread cleaning process will go quicker without a chance of distorting the threads in the aluminum knuckle. Better to trim out the old thread lock compound then trying to push it off of the thread form. Or you can clean out the hole with a tap if one is available. Yup, this is exactly what I did. Make sure you don't create any burrs on the threads! Although your suggestion might go quicker (with the exception of taking the time to cut a groove into the bolt), my approach worked out perfectly fine. Again, make sure the threads in the bolt are not imperfect and go back and forth clearing the Loctite out of threads. Now, If I thought my threads were messed up or I ran into unusual resistance, yes, a tap would be the way to go. Unless you have imperfect or messed up threads to begin with, there is no problem with this approach. Its kind of funny, [MENTION=19066]Epiphany[/MENTION] suggested this approach to me after I was about halfway done. Zitrosounds, H6G and Epiphany like this. Appreciate the write up. I may try to install mine next weekend. Either method is fine and yours definitely carries less risk assuming the bolt is in good shape. You can easily mangle the threads with an imperfect cut or a tap that's being misused. Ultimately a chase tap is the way to go. Technically, a regular tap is designed to cut threads. Even when used just to clean up, a regular tap can and will remove some virgin material in addition to any thread locker, etc. Problem is, chase taps can be difficult to source in bigger sizes and the factory M14 x 2 thread is a "bigger" size. The suggestion to groove a fastener to in effect, create a chase tap, is indeed a good one. The problem is that many home mechanics aren't aware of how to do it or don't have the capability. It is simple to do it if you do. I start with a new bolt in the appropriate size, and use a Dremel with a small stone to create a few grooves (they don't have to be full length). This does help to release trapped debris and prevents it from binding the fastener up. Here's one I did with a GT350 test knuckle. Running a clean bolt in and out a few times while blowing out the factory blind holes with compressed air works sufficiently too. I think Tom can attest to how much thread locker is in the threaded hole. You can see residual bits of it get between the caliper and knuckle flats. Some insight here....when Ford tests for days on end they need(ed) to access the pads quickly and were using anti-seize on OEM bolts of the GT350 (where the bolt enters the knuckle). They recognize what a PIA it is to service the front pads with the original bolts. Thanks for taking the time to document this installation, it is really well done! I will use this when I install the caliber studs in the future. Nice Tom. Just ordered a set for the R.
Nice write up, thanks for the pics! You went w the stainless and not the 4340s. Could you let us know how you decided? I prefer to cut the cleaning groove with 90' edge of a file held at 60' angle in an original bolt. Tap will remove some metal. You should use some break cleaner or loctite primer on hole and bolt and wear gloves to keep finger grease off. Follow this rule on all threads in aluminum and it will stop the corrosions that cause thread failure in aluminum. Way back when I had the track pack, I had a long conversation with Epiphany about this subject matter. The conclusion to the matter was that 4340 was stronger and would provide the best strength. I was advised that for all practical purposes there really wasn't much of a difference between stainless and the 4340 for this application. I chose the 4340. At the time, Epiphany didn't have 4340 in stock. Daytona was right around the corner and time was of the essence. What Tob did was sent me a set of the stainless and promised to expedite the 4340 when it arrived. I was fortunate enough that Epiphany got the 4340 out just in time and it was installed in the track pack. The fact is 4340 is stronger than stainless, but all these studs do is hold the caliper in place against sheering brake forces. So I guess it is safe to say that Epiphany is one of my sponsors in the HR361 build. All that aside, this modification is one of the best things you can do with your car. If you track, it is a must. Who enjoys a brake pad change? With the caliperfexion studs, it makes it a snap. Now with the extension rods it is even easier. when HR871 needs a brake change, caliperfexion studs will be part of the job. At that time, I will be placing another order. Again, thanks to Epiphany for the great product and great support! Tank, Epiphany and mkonrad like this. You should use some break cleaner or loctite primer on hole and bolt and wear gloves to keep finger grease off. Follow this rule on all threads in aluminum and it will stop the corrosions that cause thread failure in aluminum. Be extremely wary of chemical cleaners and the potential damage they can cause at fastened junctures. Hydrogen can be introduced into the fastener or aluminum knuckle even after the parts are placed into service. Hydrogen embrittlement can be introduced as a byproduct of this newfound chemical reaction. Chlorinated "cleaners" are something that should not be introduced into the joint. When HE issues do occur it is typically in fasteners with an HRC of over 40. The HRC numbers for Caliperfexion hardware is below that threshold with the stainless at 34 and the 4340 at 38. The factory bolt is in the same range. Always use the mildest cleaner possible if you feel you need to use it. Read the label clearly and understand what you are about to do. This goes for critical fasteners of any vehicle related component. Zitrosounds, DocWalt and FogcitySF like this. Has anyone else had problems opening the website for this the past few days? Thanks, Tom I was using .com not . net. Got the stainless set coming. Should have today or tomorrow. Will try and get on this weekend.